Walking the paths of the Roman Forum in mid October, it’s remarkable how hot and steamy the city can be, even in autumn. The Forum is all columns and facades, but few ceilings, so there’s not many places where you can escape the sun’s implacable rays. Following a set of stairs up the Palantine Hill just to the south and you’re instantly in a different world. There are gentle, slender paths, tall umbrella pines, bright flowers, and, thankfully, water taps to drink from or fill your bottle. There’s even a bathroom almost hidden away behind some bushes and slender trees. Walk further back and you’ll find the ruins of the Flavian palace and Domus Augustana, the temples of Cybele and Apolo, the thermal baths, and even a hippodrome. You immediately feel less tired and dusty, and, perhaps influenced by the belief of the ancient Romans that the air was cleaner on the Palantine, you feel refreshed and a little lighter. Looking north east from the Palantine, the Forum and the rest of Rome stretches out before you like a gift. The city is crowded now, with cars and motorbikes threading their way along Via dei Fori Romani, Via Cavour and beyond, but back in the fourth century AD, it must have been an amazing sight. The city was built of travertine, which would have made it brilliant in the sunlight, even in October. There would have been fewer people and, up on the Palantine, the most toni of residential zip codes reserved for nobility and the city’s elite, likely would have been quiet and serene. 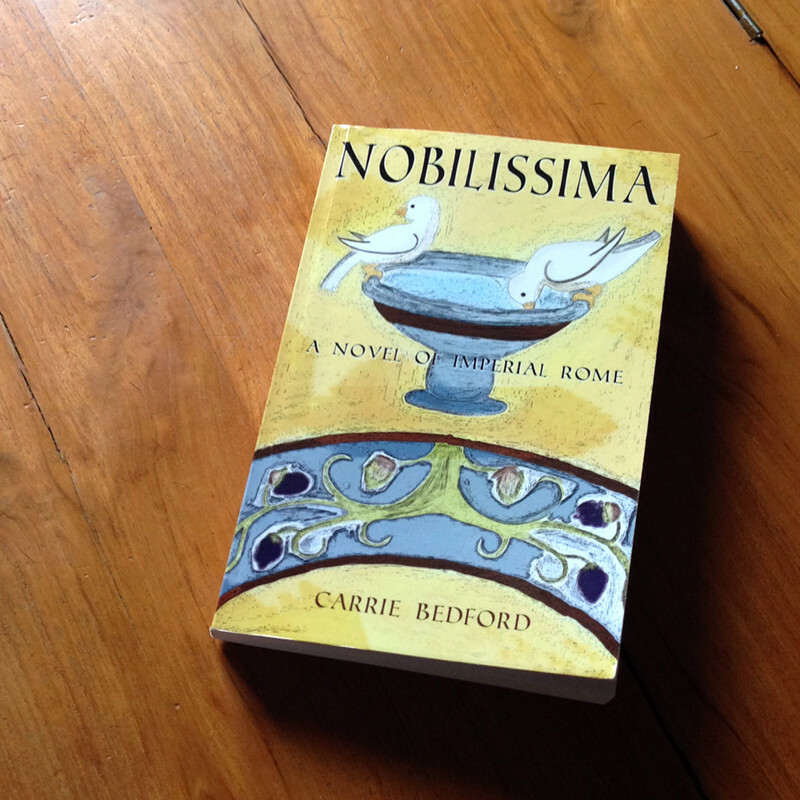 This is the Rome that unfolded in my mind as I read Carrie Bedford’s Nobilissima: A Novel of Imperial Rome (amazon.ca / amazon.com). From her balcony on the Palantine Hill, Galla Placidia, the sister to the Roman Emperor and the main character of Bedford’s book, gazes out at her marble city from the comfort of the Palantine oasis. She’s beautiful. She wears amazing clothes and jewelry. And she’s smart, down to earth, fiercely loyal, and adventurous. The kind of heroine that’s easy to love. And of course, because she’s so smart, she has amazing friends who are easy to admire too: Sylvia the straight-talking maid; Aurelia, the loyal friend who would, and does, follow Placidia into any danger; Marcus (whom I pictured as George Clooney because he’s so darn heroic! ); Gardius, the wise statesman; Ursus, the wine-drinking Bishop; and Tertius, the cat-loving teacher. There’s also some romance (but I won’t ruin it…). Then there are the villains I love to hate: Honorius, the cowardly psychopathic brother and Emperor (were all Roman Emperors crazy?!? ); Olympius, Honorius’ creepy right-hand man (whom I always pictured as Alan Rickman with slicked back hair); and Sigeric, the even creepier, but heftier (in the movie in my mind, anyway) Goth soldier. From the start, with her blending of wonderful characters and absolutely gorgeous descriptions of Rome, Ravenna, Barcino and Constantinople, I was amazed at Bedford’s ability to weave in so much historical detail (who knew the Goths were so dedicated to burial rites for their kings? Or that Ravenna’s surrounding swampland was a key defensive feature?) into this page-turner of a story. There were quite a few times, during the vicious battles against Sigeric in Barcino or the nail-biting sea crossing to Constantinople, for example, when I literally gasped and peeked ahead a few pages to make sure everything was going to turn out. The tension was incredible! Now I’m just sad it’s over! But next time I’m in Rome, I’ll have that brilliant view from the Palantine to imagine and admire. Thank you, Carrie Bedford!